Today's 1966 Airstream Tradewind Landyacht makes me want to go on my dream tour of journeying this continent from East to West. Isn't the Airstream aura of exploring the wild, freedom and the American Dream so much present in this painting? The colors here are very much foreign to my local landscape here with the lush vegetation of Eastern Canada and the Atlantic Ocean ever present with its changing dark blues. I took my time with this one. Actually, each one painting so far has taken me much longer than I expected, but that is OK, as I try to take these daily practices to better my craft and I want to push myself to do the best I can. Airstreams don't have corners. Those 'silver bullets' how they are also lovingly called are a challenge to paint in the correct perspective. 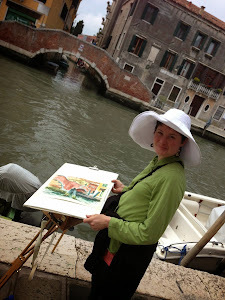 I am a colorist, color is what excites me in a painting. Perspective is something that is not my main focus, but here with airstreams I try to get it correct, or close to. 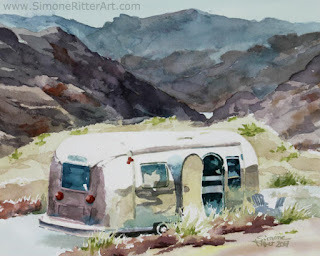 An Airstream would be a dream-come-true for this gal, and until this day comes- if ever- I love to create paintings of them! Please know that painting each and everyone of these vintage treasures is a great honor for me and I feel very fortunate being able to do so.